Adler's Ridge is a one-bedroom beautifully decorated cabin that sleeps up to four people with comfort and charm. 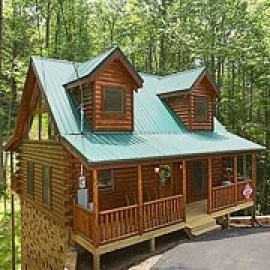 It is conveniently nestled in a wooded mountain setting and located just minutes from both Gatlinburg and Pigeon Forge. 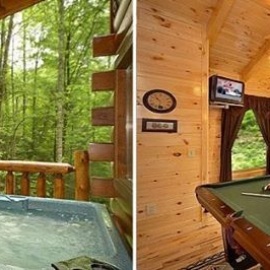 Enjoy relaxing in a rocking chair or in the hot tub on the covered porch surrounded by nature. Once inside, guests will find custom crafted birch hardwood floors, vaulted ceilings and tongue & groove logs. Handcrafted log tables enhance the rustic experience while mounted just above a custom log mantel is a 42" Plasma High Definition Flat Screen TV with built in Surround Sound and HDTV cable channels. A fully appointed kitchen with stainless steel appliances sits adjacent to a cozy breakfast bar. For added convenience, a closet houses a full sized stacked washer and dryer, just off the living room. Ascend the stairs to enjoy a game room that houses a full sized pool table and 20" flat screen box TV with built in DVD. Guests can kick back and play board games at the pub table or relax at the wall bar. Retreat to the bedroom with its own stone fireplace and relax in the King size bed or in the indoor Jacuzzi tub. This bedroom also has an adjoining full bath. Guests will create wonderful Smoky Mountain memories in this charming cabin, so come visit Adler's Ridge, and make your vacation dreams come true!